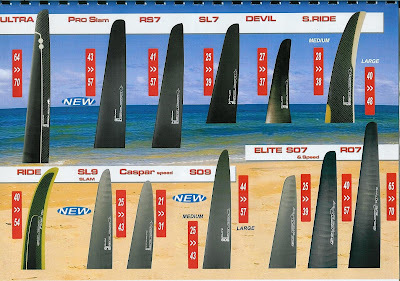 For 2009 Select will have serious range of fast fins, I can't wait to test the new fins!!!! 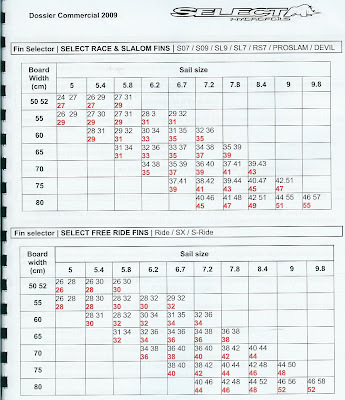 The SL9 is based on his very fast and succesfull brother SL7, only the SL9 will be more forgiving, I haven't seen it but there were rumors they might changed the profile for even better topspeed. The Caspar Speed fins are famous in the Netherlands, amazing performance are the fins from the hands of Caspar Verhaagen. I hope Select can do this too in production! I'll will be ordering these fins!! I hope the S09 brings the same as the S07 M fins compared to the SL7. This fin could be the USM winner in my eyes! You'll be the first ones to know how the fins perform!!! Can't wait to test the new fins. I think the ProSlam is the replacement of the Ghost 2008. Very interesting information and really up to date. Thank you, I hope the Select Caspar Speed are as good as I think they will be. Hopefully there will be more information soon on the web regarding the new fins. I still have some Tectonics left, but normally using the 2008 Selects. I think the SL09 would be more forgiving in the chop comparing to the SL07? I don't know the Ghost. How would you/anybody describe that fin? Is it fast, can it handle a lot off pressure. Does it give a lot off lift (stifness). About the 2009 series I really can't tell more, it is now just theory. I haven't felt, or even seen the new fins. But when I do have I will post my experience on the blog. (2)No doubt the Ghost can handle lots off pressure! All select fins are tested to handle lots of pressure, this is kind of trademark of select. Ziet er goed uit! En ik sta op 3de op de gps ranking van Select, erg leuk! Onder Ben vd Steen.